Modular Cliff/Rock for big rock formations assemblies. (check the promo images). Sculpted on every side with modularity in mind. 8k textures: Albedo AO Normal Roughness. Medium res .obj with good topology. Hi-res Zbrush file. Fantastic work! Please keep it up!!! I see this is available as a "medium res" object. Any chance you have this model available in a low and ultra-low poly version? No, I am afraid not. 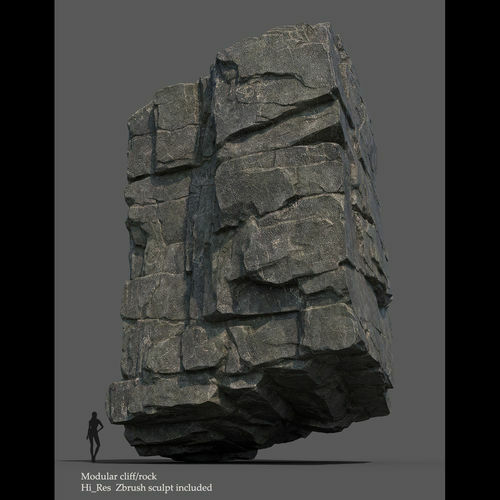 I have included HI res version of the rock which you can use to make low poly version of desired poly count and then bake the maps yourself.